Cal Coast Termite & Pest Inc.
About Cal Coast Termite & Pest Inc.
What people say about Cal Coast Termite & Pest Inc. Started work completed work as stated. Happy with all work performed. I’ve done business with Cal Coast for many years. Their employees are always on time, polite and professional. The office has good communication as to what day and about the time they will show up. All around professional and courteous! Frank was thorough, professional, and friendly. Thanks so much for the great service! We have worked with Cal Coast Termite & Pest Inc. for many years. They provide excellent service and their technicians are very conscientious. The office personnel are very helpful and friendly, which makes working with Cal Coast great! Frank the salesman was very informative.... The crew was on time and courteous, very pleased with the results.... I recommend cal coast to everyone... Thank you. Been using your company for several years now for the outside of my home. Once in awhile there has been a few problems but you have come right back and taken care of it. Knowledgeable, friendly and efficient. I have used their services for years!! we’ve been with cal coast termite for years & they always go above & beyond to fit our busy family schedules & are so knowledgeable & nice! wouldn’t dream of going anywhere else! A great company that I trust. We had termite service performed on our house on 10/27/18. Lalo, our service provider, was the ultimate professional; excellent customer service, extremely knowledgeable, conscientious to ensure the work was thorough and complete. I will recommend Cal Coast Termite to everyone. They are our go-to pest control company, moving forward. Richard & Sarah Peralta, Lakewood. Tommy and David were terrific. They were both personable, compentent, and on time. Everything was done was described and quoted. I reviewed you on Yelp. I am a Realtor and use Calcoast for all my Listings. I’ve always received very professional service. This last one was of my own home. I feel they went above and beyond!! Thank you Calcoast!!! Have been with Cal Coast Termite for many years with an annual contract for termite service. I have always found them to be polite and on time for appointments. Have been dealing with Jessica (in the office) and find her to be a special lady. Today I had wood replacement due to termite wood rot found at last weeks inspection. Dave was in charge of the job and when purchasing new wood took the time to have my existing paint matched for new wood. The job was done in a timely manner and looks great. Would definitely recommend this company to everyone. Cal Coast and Juan are great. Juan is very easy to work with and does what we need. They show up when they are suppose to which is very important to us since we are a government approved warehouse. Thank you Cal Coast and Juan!!! We appreciate your business and thank you for the great review! We have been working with and referring Cal Coast Termite to our clients for over 20 years. They are excellent to work with! They always make our clients their priority. They are honest and priced extremely well! We also love working with all their staff- especially Jessica. They always take care of us. Work was fantastic, quick, well done, and completed correctly the first time. I am very satisfied with job you did and will use you in my coming jobs. Also give you a ***** rating. Service as always was excellent. Both the inspector and the follow-up repairman were thorough, clean and professional. Thank you. Great service, my first time using your company and I am glad I did. You were very accommodating with the dates we needed work done and getting the certification we needed for lender. We have been using Cal Coast for over ten years. Have used them for monthly pest control, annual termite service, and damaged wood repairs. All a good experience ... good team. 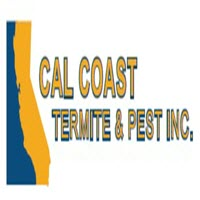 We have used Cal Coast Termite and Pest Inc. for many years and continue to be very pleased with their service -- they come when scheduled and do excellent work in a most pleasant manner. We would recommend them highly to others looking to find an honest and reliable termite inspection organization. Cal coast is protecting my home for many years. I am happy with their professional services. Eddie did a great job. Thank you for quick and effective service, good communication. Great Company to work with!! I called them and they got the work done right away!! I was blown away by their Outstanding fast Customer service!! I will highly recommend this company to my clients❤️Sincerely, Real Estate Agent Dulce Poncelis. Very happy with your service!!! We have loved working with Cal Coast Termite for over 15 years. They always go above and beyond to take care of the clients we refer to them. They always try to work with the schedules and their prices are great! We have been very happy with Cal Coast! and the people working are great! Looking for a very tight company to help you with termites, cal coast is the one! We have used them on multiple occasions and couldn't be more happy. From the nice ladies on the phone, inspection team , as well as the boys that do the work , all are on point. Very prompt and professional team. Thanks so much. Cal Coast has been providing pest control services for our home for a number of years now. I signed up for the annual termite review, so each year they come and do an inspection and spot treat as necessary. If I find any signs of termites during the remainder of the year, they will come and treat them without additional expense. I have also used them for a rat investation in the guest house attic. They were able to rid us of the problem. I also paid them to seal the attic with wire over the vents, etc. and that has also been very effective. I highly recommend them. Thank you for the great review! We appreciate your years of business and look forward to working with you in the years to come! Great customer service. The technicians were very friendly. They were on time and very responsive. Thank you for the great review! We appreciate you choosing Cal Coast for your termite and pest control needs! I am very happy with service. I have three commercial buildings! Everyone from the ladies in the office to the inspector were so wonderful! Great customer service and very fair pricing! Thank you for the great review! We appreciate your business and look forward to servicing you in the future.